Turtles are the longest living creatures in our oceans, capable of living to be two hundred years or more, yet they are rarely allowed that privilege. Nature itself has always been rough on these creatures and man is no exception. It takes about twenty-five years before the turtles reproduce and maybe one in one thousand hatchlings in the wild will make it to maturity. They face growing dangers from hunting and effects of other human activities. Before plastics were around, these turtles were hunted and killed for their shells for the purpose of making combs, spectacle frames, buttons, and other decorative items. Now, both adults and their eggs are hunted for human consumption and their reproductive cycle is disrupted by human development along beaches causing the hatchlings to travel at night not toward moonlight as their instinct tells them to do, but the wrong way, toward the brighter lights of the town. Now, besides only working with turtles, I strive to pass on my work and philosophy, to save the turtles for future generations. We also have some Red-foot Tortoises we use for educational purposes. Red-foots are protected under Appendix II of the Convention on International Trade in Endangered Species (CITES). 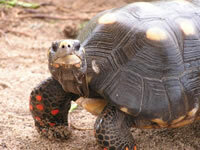 Red-footed tortoises live in tropical forests and grasslands in northern South America and some islands of the Caribbean.